Inviting the nations to the light, they came to Christ. Being the first to enter June. On the seventeenth Junia and Andronikos died. 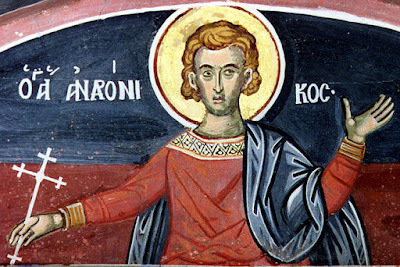 The Holy Apostle Paul wrote in Romans 16:7, "Greet Andronikos and Junia, my kinsmen, and my fellow prisoners, who are of note among the apostles, who also were in Christ before me." According to this verse, Andronikos and Junia were kinsman (or relatives, compatriots) of Paul and fellow prisoners at some time, particularly well-known among the apostles, and had become followers of Jesus Christ before Paul's Damascus road conversion. It is generally assumed that Junia was his wife, but they could have been brother and sister, or father and daughter, or Junia was his assistant as tradition records, or no close relation to each other, except to Paul as kinsmen. Since they are mentioned by Paul in his epistles, they are numbered among the Seventy Apostles. "This also looks like an encomium. And what follows is much more so. And what sort is this of? 'And my fellow prisoners.' For this is the greatest honor, the noble proclamation. And where was Paul a prisoner, that he should call them 'my fellow prisoners?' A prisoner indeed he had not been, but he had suffered things worse than prisoners, in being not an alien only to his country and his family, but in wrestling with famine and continual death, and thousands of other things. For of a prisoner the only misfortune is this, that he is separated from his relations, and often has to be a slave instead of being free. But in this case one may mention temptations thick as snow-flakes, which this blessed person underwent by being carried and taken about, scourged, fettered, stoned, shipwrecked, with countless people plotting against him. And captives indeed have no further foe after they are led away, but they even experience great care from those who have taken them. But this man was continually in the midst of enemies, and saw spears on every side, and sharpened swords, and arrays, and battles. Since then it was likely that these shared many dangers with him, he calls them fellow captives. As in another passage also, 'Aristarchos my fellow prisoner' (Col. 4:10). Then another praise besides. 'Who are of note among the Apostles.' And indeed to be an apostles at all is a great thing. But to be even among these of note, just consider what a great encomium this is! But they were of note owing to their works, to their achievements. Oh! 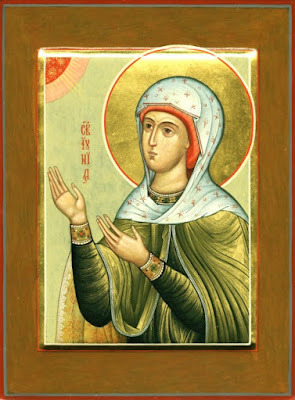 How great is the devotion (φιλοσοφία) of this woman, that she should be even counted worthy of the appellation of apostle! But even here he does not stop, but adds another encomium besides, and says, 'Who were also in Christ before me.' For this too is a very great praise, that they sprang forth and came before others. But let me draw your attention to the holy soul, how untainted it is by vanity. For after glory such as his in kind and degree, he sets others before himself, and does not hide from us the fact of his having come after them, nor is ashamed of confessing this. And why are you surprised at his not being ashamed of this, when he shuns not even to parade before men his former life, calling himself 'a blasphemer, and a persecutor?' (1 Tim. 1:13) Since then he was not able to set them before others on this score, he looked out himself, who had come in after others, and from this he did find means of bestowing a praise upon them by saying, 'Who were in Christ before me.'" According to the Synaxarion, these Holy Apostles went throughout the world as if they had wings, and they cut at the root the delusion of idolatry. Andronikos had been ordained the bishop of Pannonia, but did not remain in one place. Junia was an assistant of Andronikos in his mission, having cut herself off completely from worldly things and followed Christ. Both brought many unbelievers to the knowledge of the true God. Having destroyed many temples of idols, they built everywhere they went Christian churches. Many who were possessed by unclean spirits they delivered, and untreatable illnesses they were able to cure. It is believed that they died as martyrs. In the seventh century their holy relics were discovered in Eugenios of Constantinople (Feb. 22). Saint Andronikos is also celebrated on July 30th. You shone forth as Apostles and heralds of Christ, sowing the preaching of grace among all men. 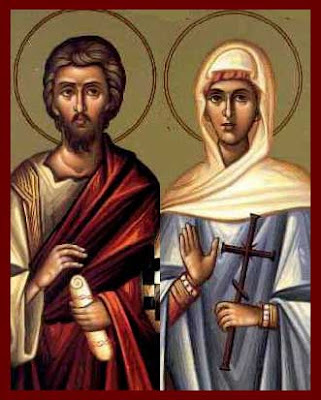 Therefore we praise you, illustrious Andronikos and Junia, as we exalt Christ our God. Let us praise these two Apostles of Christ, Andronikos the star who enlightened the heathen, and Junia his fellow labourer; and let us cry: Intercede to Christ our God unceasingly for us all.